No Rock’n Play… Now What?! Oh, the Rock’n Play Sleeper… this device has been a God send for many sleep deprived parents as it is the only place their newborn will give them a solid stretch of sleep. However, the Consumer Products Safety Commission (CPSC) has recently recalled all models of this device and left many parents with unanswered questions. Is it ever safe for sleep? Is it safe for sleep before baby is able to roll over? Unfortunately, the answer to both of these questions is NO. According to the American Academy of Pediatrics (AAP) the ONLY safe sleep environment for your baby is on a flat, firm surface and placed on their back. Unfortunately, the Rock’n Play and other devices marketed as “sleepers” are misleading and do not meet these criteria. The CPSC recognizes only cribs, bassinets, play yards and pack and plays as safe sleep devices. While rolling in the Rock’n Play contributed to some of the 32 reported fatalities, it did not for all. So what else is happening? Positional Asphyxia, which is when a baby’s position prevents them from breathing adequately. When a baby with limited head and neck control is placed on an inclined surface for sleep their head can slump forward into a chin to chest position and constrict their airway. This is why the flat surface is so important! Back to sleep for every sleep– It is recommended that infants up to one year of age are always placed on their back for sleep. Naps are just as important as overnight sleep, too! And what happens when baby starts to roll to their stomach? As long as you place baby on their back you can let them sleep in whatever position they get themselves into. Use a firm sleep surface– Make sure whatever surface you use is intended for infant sleep and has a fitted sheet and no loose blankets. Adult Mattresses, couches and futons are not appropriate for infant sleep. Breastfeeding is recommended– Did you know it can reduce the risk of SIDS by up to 50%?! Keep soft and loose objects out of and away from the crib– Use a wearable blanket to keep baby warm! Also, while swaddling is recommended, it should be discontinued by 8-weeks of age or when baby is able to roll, whichever comes first. It is recommended to wait until baby is one year old to introduce a lovey or stuffed animal. And bumpers are a no go, even the mesh ones! While the mesh bumpers do not pose the risk of suffocation, it does not protect the baby from entrapment and/or strangulation. Consider using a pacifier- Offering the baby a pacifier has been shown to reduce the risk of SIDS. And if the pacifier falls out once they are asleep don’t worry about putting it back in. Avoid overheating and head covering in infants– Babies should not sleep in hats or outfits with hoods. Check baby for overheating by feeling the chest. Baby should not feel sweaty or overly hot to the touch. A good rule of thumb is to dress baby in one more layer than the adults in the house. Infants should be immunized in accordance to the AAP and Center for Disease Control Recommendations- Contrary to a popular myth, it has been proven that there is no connection between vaccinations and incidence of SIDS. For the full and detailed list of recommendations visit the AAP’s webpage on safe sleep. As Postpartum Doulas and trained Infant Care Specialist we understand that all of this information can be overwhelming. Especially when feeling the all so real effects of sleep deprivation and your baby just WON’T sleep in anything but the Rock N’Play, swing or bouncy seat. So, what are some tips for getting baby to sleep on the safe sleep surface? While it is tempting to rock or nurse/bottle feed baby to sleep, putting baby in their bed awake, but drowsy, makes a big difference in getting them sleep there. It may seem like an impossible concept but rather than putting baby down and running, try to help them settle into their bed by rocking until you see some big yawns and other signs of a sleepy but calm baby. Then place them on their back but stay with them rubbing their belly, stroking their hair or singing them a song. If baby gets upset pick them up, rock and repeat the process. 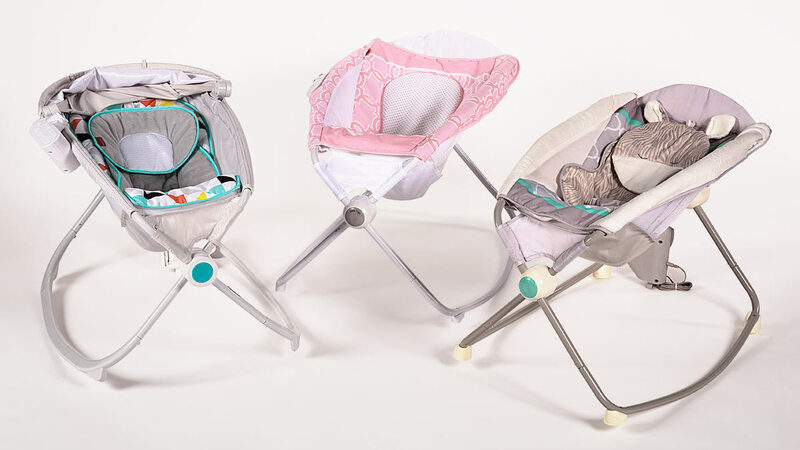 It may take some time for both of you to get used to this new routine but sooner than later baby will start to enjoy their sleep space and all you have to do is put them down and walk away! We find that having a short but consistent bedtime routine can help signal to baby that it’s time to sleep. Other things that can help are a white noise machine and a snug swaddle (before 8 weeks old). And for when the times that sleep is really rocky, enlist help! We suggest that parents split the night up. For example, one parent will wake up with the baby the first half of the night and the other parent will wake up with the baby the second half of the night. That way each parent knows they will have a portion of the night where they will get uninterrupted sleep. You can also consider enlisting the help of a postpartum Doula! Our team at Boston Birth Associates offers overnight support helping to ensure you get some much-needed sleep and baby stays safe and happy all night long. To learn more call us at (978) 764-4414 or visit our site!